Floating venues have a charm and elegance that elevates mundane functions to an all-new level. This concept was first brought about on Showboats by combining a dinner cruise with a show ranging from comedy plays to serious dramas to bands. We look at some of the long-standing iconic floating venues around the world that are worth a mention because of their unique history! Celebrating 30 Years of Spectacular Cruising, Sydney Showboats is a floating venue on Sydney Harbour that celebrates the best of dining cruises with cabaret performances that form the main entertainment for the evening. A vessel that exudes old-world charm with a retro-style construction and wrap-around verandas. Showboat mixes contemporary construction with modern luxuries to give its guests an exquisite time. The cabaret show is a visual treat and the main highlight of the Showboat. The speciality of Sydney Showboats is that it was a purpose-built vessel for hosting shows and awards functions. So all the amenities were thought out and designed at infancy. The glitz of cabaret show and deluxe dining experience makes the Showboat a unique venue resulting in its continuing success. Another iconic ship that is a famous floating venue is the Thekla. In existence for over 33 years, the venue has hosted a variety of events from operas to concerts. Known before as the Old Profanity Showboat. It was a happy hunting ground for numerous budding actors and comedians. John Entwistle, bass guitarist of the famous band ‘The Who’ had graced these stages during the Old Profanity days. The boat changed hands in 1986 to become the Thekla again. It became a thriving spot for the local bands of Bristol. By the early 2000s till now, the Thekla has been around as a thriving nightclub. And one of the iconic landmarks of Britain. The father of showboats. The Goldenrod is the original iteration straight from the 19th century. Plying the waters of Mississippi from 1909. The Goldenrod continued service till 2001 after which it was unceremoniously abandoned on the Missouri River at St. Charles where it still lies in a dilapidated stage. In its glory days, the Goldenrod was the most well-appointed and ornate of all Showboats with opulent interiors, making it stand a head higher than its competition. Like the Showboats during this time period, the Goldenrod didn’t have propulsion of its own and had to use the services of a tug boat to move from place to place. It Only Happens In Sydney! The Christmas season has popularly been associated with snow, building a snowman, throwing snowballs at each other, enjoying a Christmas party feast near the fireplace, and waiting for Santa to come in his reindeer sleigh bearing gifts for all. But for everyone in Australia, a ‘white Christmas’ is mere fantasy! Being in the Southern Hemisphere, the country experiences summer during the month of December. With this unusual weather, Christmas celebrations turn out to be quite unique. Sydney, being one of the most popular cities in the continent, gets dolled up with fairy lights and glittery stars to welcome a large number of outsiders who come in to experience something different. Numerous fun events and mouth-watering feasts are hosted at many Christmas party venues in Sydney to celebrate the joyous occasion, Sydney Christmas party cruises being the most popular. But what will mesmerise you the most are the unimaginable views you will come across as you stroll through these venues. The Santa gives rest to his reindeers when he is in Sydney. Thus, nobody here knows ‘Rudolph the Reindeer’ or any of the reindeer songs. Sydney, in unison, sings ‘Six White Boomers’ for Christmas – a song which tells the story of how the heat is too much for the reindeers. He rides here with his boomers (Aussie slang for a male kangaroo) to deliver the toys and even help a little joey (a baby kangaroo) find his mother. Santa sheds his red woollen suit when in Sydney. The juxtaposition of Santa costumes and surfer dudes may be bizarre to a lot of us, but in Australia it is an actuality. To be honest, it’s a pretty amazing sight. If you cannot spot a surfing Santa anywhere, keep an eye out for the Instagram hashtags – they will take you to the right place. Sydneysiders are not ready to give up the idea of building a snowman. But Christmas means summer and summer means the beach. So try your luck with building a sandman. If you want to follow the conventions, give him a carrot nose and a scarf. But don’t expect the nose to be there for long, the many sea-shore birds might snaffle it away. With over 100 beaches around the city, Sydneysiders find it easy to replace snow fights with water fights. And when it comes to official business, Christmas party cruises are the first idea that pops up when shortlisting corporate Christmas party venues in Sydney. Families too love spending time cruising around Sydney Harbour as most of the operators come up with impressive deals, including a delightful feast. Be it anytime of the year, Sydneysiders love playing their national sport. But the breezy summer holiday forces them to get out with a bat & ball and a couple of sticks to make a rudimentary wicket. The Australian professional Twenty20 cricket league, Big Bash League, is also held in the summer and usually hosts a match on Christmas eve. The entire city gathers at the Sydney Cricket Ground cheering their team along with the tunes of Christmas carols! Entertainment cruises on Sydney Harbour for a fun-filled night! When in Sydney, a harbour cruise is a must-do experience. And when you can have one comprising entertainment featuring world-class performers who will wow you with jaw-dropping performances, why settle for an ordinary cruising experience. 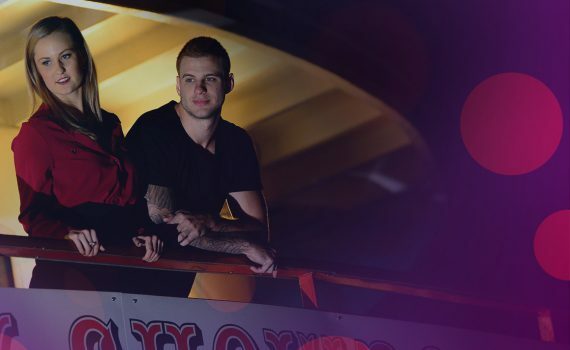 When the sun goes down, the night heats up on Sydney Harbour dinner cruises with high-stakes thrills of live music, comedy shows and much more. Complemented with a sumptuous dinner right in the middle of the city and roving views of the iconic Sydney Harbour Bridge and the spectacular Opera House. These cruises are an infallible option for a delightful night. Fancy a cabaret performance to go with your dinner? 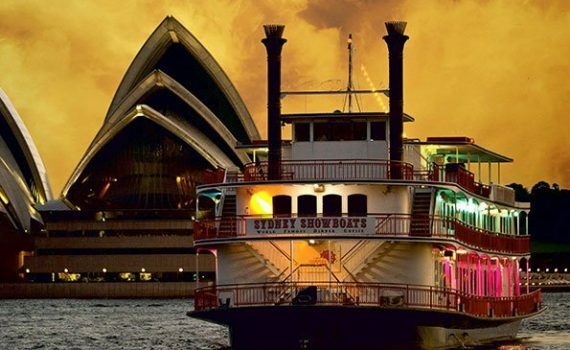 Step aboard Sydney Showboats for a three hour dinner cruise and a night full of glitz & glam. Say hello to the glamorous Australian showgirls in shimmering costumes who will welcome you on board and relish on a delicious 3-course entrée. Steal a glance of amazing nightscapes of Sydney Harbour as you pass Sydney Harbour Bridge and Opera House. Drumrolls! It’s time for ‘Voyage of Love’, a mindblowing, high-energy cabaret show by talented Australian cast. The exuberant music and flamboyant acts are definite to hark you back to the time when cabaret was king. Bust your gut with the Prince of Polyester. When in Sydney, do not miss the comedy cruise presenting Bob Downe, the man of enduring comedy characters. Enjoy a delicious three-course meal and spectacular Harbour views as Bob entertains you with with his unique moves and cheeky laughs. Sydney Harbour also has many other comedy cruises that run daily, serving you a sumptuous dinner sided by plenty of laughs. Rave up your night with Latino entertainment, live drum beats and energetic music aboard Vagabond cruise. With a live floor packed with performers in vibrant Brazilian costumes dancing to explosive music topped by a tantalizing menu and million dollar views of Sydney Harbour, every second here feels like a fiesta. Are you a concert-goer? 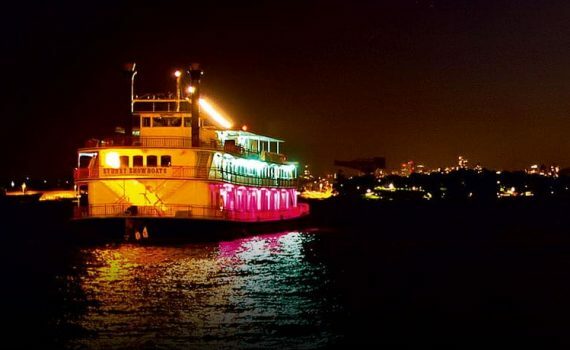 Enjoy a gig on water aboard one-of-the-many tribute cruises on Sydney Harbour. Trip down memory lane with bands and solo artists singing to repertoire of greatest performers like ABBA and Elvis Presley. Some cruises also host crossover shows like the ‘Beatles meets Elvis Tribute Show’. And if your legs get tired of dancing, lean back and relax to take in amazing views of Sydney nightscapes. A fan of classic hits? Jollo at spectacular 80’s party on board a retro cruise on Sydney Harbour. The lurid colours, freaky hairstyle, dodgy mullets and wide moustaches will take you back to memories of old school discos, prom night and also of the first time you ever stepped on a dance floor. Adding to the fun is a sumptuous meal to fill your stomach. Most cruises also have an on board bar for offering martini to go with your samba moves. So board a cruise and let the dazzling stage sets, brilliant performers, modern hits and timeless classics come together to create a night forever to cherish! Dining used to be a simple affair, with people seated around a table sharing a meal, complimenting the chef if the food was exemplary, and the like. Fast forward to the present – dining as a concept has been revolutionised with mind-boggling variations to a simple, predictable activity! In Sydney, you have fine dining options to restaurants where you can dine and enjoy live music or a live show, and even luxury Sydney dinner cruise as well! When we look at the history of dining, ancient Romans were the ones who started hosting dinner parties with exotic and intricately prepared dishes. During or after the dinner, the Roman Emperor and senators would congregate and discuss matters of state. The English dinner parties hosted in the late 1880s were more formal affairs, with printed invitations and elaborate food displays. They would be followed by entertainment that included singing or poetry recitals. The first entertainment accompaniments with dinner were string music and jazz. Having a live band playing tunes gave the place an elegance that was missing from the average restaurant. As times progressed, there would sometimes be a lead singer accompanying the band, or there would be a routine from a stand-up comedian who would make the audience erupt into peals of laughter, as they tucked into their meals. A little later, dining started to get more innovative, especially in cities like Sydney, which boasts the most beautiful natural harbour in the world. There are many dinner cruises on Sydney Harbour that offer it’s guests a luxury dining experience, while enjoying brilliant views of the city’s iconic attractions. There’s even one that offers a gourmet three-course meal as well as a live cabaret show on a vessel that’s designed like a New Orleans-style paddle wheeler. As the world moved to new ages, multiple activities were being clubbed with dining. Dining became less of a recreational pastime, and more of a stage for other activities. It’s the stage for business meetings or interviews for potential job aspirants. The food aspect of dining seems to have been side-lined with other activities taking centre stage. You get more for your money’s worth now though, with all the added entertainment inclusions. But are we missing out on something – the core part of dining, the food? We used to select a restaurant or a diner based on the dishes they were known for, and not the entertainment options available. Dining used to be a passionate affair, tasting eclectic flavours and enjoying the flavours and spices that went into making it. All these added accompaniments might have also lowered the standards of cuisine, as the main focus has shifted from dining to entertainment elements. The experience of dining is only remembered during festive occasions like Christmas or Easter, when everyone sits down to share a meal, taking in the flavours and expressing gratitude to the ones who toiled in the kitchen to put the feast on the table. There will be lively discussions and conversations with each other, but the food and feasting always hold centre stage! It’s sad though, that we are not able to experience this joy of dining more often, appreciating the flavours and the good work that goes into making each dish. Australia’s leading travel agency specialising in small ship and expedition cruises on Western Australia’s outback coast. We feature a handpicked portfolio of only the very best ships. 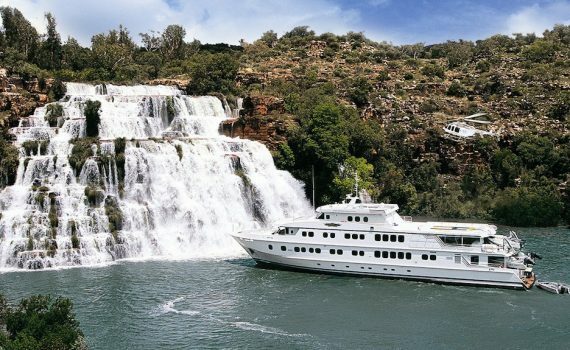 ​​The team at Kimberley Cruise Specialists know Kimberley Cruising like no other. In fact, we’ve got over 70 years combined experience in not just selling Kimberley adventure cruises, but operating them too! In 1996 we operated the Kimberley’s first major expedition cruise with our ship Coral Princess (now Coral Expeditions I) and by the time we sold Coral Princess Cruises in late 2014 we had operated almost 500 adventure cruises on this remarkable coastline. It’s this first hand knowledge – and intricate understanding about operating the very best adventure cruise experience in these remote waters – you will receive when you speak to our team of experts. We will help guide you to select the very best itinerary, and small ship, that will make your Kimberley cruising dreams become a reality. You’re also guaranteed to get the very best cruise fare possible, with opportunities for special offers and seasonal bonuses. As a full service travel agency we’re also here to help you with flights, pre and post cruise accommodation, and even 4WD tours and legendary rail journeys such as the Ghan. We’ll help you plan your Kimberley holiday of a lifetime. And don’t forget travel insurance, there’s even a 20% discount on all policies when you purchase your cruise through Kimberley Cruise Specialists. This is an adventure only a very few sailing boats in the Whitsundays can offer. … Boomerang had a new interior fitted specifically for Whitsunday Sailing Tours. … Hammer is a 75ft Maxi yacht that is indeed a true Australian yachting legend. Sailing is a fantastic way to take in the beauty and adventure of some of the best coastal and island holiday destinations in Australia and the Pacific. Sailing Whitsundays Most Popular Overnight Tours …. Mr-Travel is a fully licensedAustralian Travel Agent for your protection, our license number is #3178713. Book one of our fabulous Charter Boat and Sailing Trips for backpackers online today.Tours include both sailing and fishing trips. … Shore Thing. Sail, snorkel & dive Ningaloo Reef from Coral Bay, Western Australia. … Luxury Ningaloo sailing, snorkeling and diving tours: View All Tours. Choose from romantic overnight yacht charters for two, sailing cruises with lunch and drinks, hands-on sailing trips or something with a … Western Australia 4.